New Mexico State wide receiver A.J. Harris momentarily lost the ball after he was hit by Hawaii linebacker Micah Lau during the first half yesterday in Las Cruces, N.M. Harris maintained possession for the Aggies. LAS CRUCES, N.M. » Hawaii is in danger of losing its football identity -- at least the popular perception of teams that haven't played the Warriors. UH's national image as a finesse team that can't win on the road took a serious pounding last night, almost as rough as the one UH laid on New Mexico State in the fourth quarter as 17,318 watched at Aggie Memorial Stadium. Hawaii ruined a second consecutive homecoming by dominating the end game after NMSU, nearly a three-touchdown underdog, managed to hang within four points with three quarters in the books. UH's Colt Brennan (330 passing yards, five touchdowns) and NMSU's Chase Holbrook (323 yards, three TDs) didn't disappoint for the most part in the highly anticipated matchup of prolific quarterbacks. But it was Hawaii's huge defensive plays late in the game that allowed the Warriors to take control and win 49-30. Hawaii (5-2, 3-1 WAC) won its fourth consecutive game. The Aggies (2-5, 0-3) are still looking for their first win against a Division I-A team since 2004. "I told the team it was going to be a dogfight," Warriors coach June Jones said. "Whoever hit the hardest and got turnovers and took care of the ball would win. We did that. We got some big hits and turnovers and that made the difference." Coupled with UH's 68-37 win at Fresno State last week, the Warriors have now won road games consecutively for the first time since they were victorious at Oregon and Air Force to start the 1992 season. UH is still a game behind unbeaten Boise State (the last team Hawaii lost against) in the standings, but Aggies coach Hal Mumme said the Warriors are a better team. "I think they are the best team in our conference. We've played all the top teams now and those guys are road warriors," Mumme said. "You realize they've been on the road four out of the last eight weeks and with who've they had to play, June has done a real good job." So did the UH defense last night, when the game was on the line. 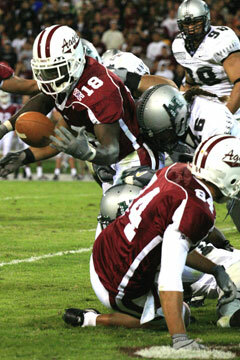 The Warriors forced the Aggies to turn the ball over on downs and to fumble twice late in the game, resulting in 21 Hawaii points that put it out of reach. Sophomore linebacker Adam Leonard scooped up a fumble forced by end Mel Purcell's big hit on Holbrook. Leonard returned it 20 yards for his first touchdown since high school and a 42-24 lead with 11:11 left. "Our motive was to come out and get some turnovers, and everybody came out fired up. We just had big plays," Purcell said. Leonard was in on 11 tackles. "We knew whatever plays their offense made we just had to line up and try again," said Leonard, of going up against the nation's No. 1-ranked passing offense. "We just had to play longer than them and keep pushing and pushing and finally we made some plays at the end." Hawaii's Nate Ilaoa ran past New Mexico State linebacker Michael Brewer for a first-quarter touchdown yesterday. A dividend of the play was Holbrook being knocked out of the game for the next few plays. "It caught me out of the ceiling," Holbrook said. "It just dazed me a bit. He got a solid hit on me, I didn't see him coming. It was a clean tackle." When Holbrook did return, he fumbled the snap from center and UH's Kahai LaCount recovered at the New Mexico State 42. Two plays later, Ross Dickerson scored his second touchdown of the game on a 36-yard pass from Brennan, and the Warriors owned a 49-24 lead with 7:58 left. "It had to be that way," said Dickerson, who led UH with six catches for 125 yards. "Because their receivers can catch the ball. And our defense had to hit them in the mouth to give us the ball back. They can score and we can score. So whoever's defense was there, out there hitting, making guys fumble (would win)." And running back Nate Ilaoa, along with the UH offensive line, also provided a physical presence. Ilaoa pounded the Aggies' weak defense for 94 yards and the game's first touchdown rushing and 41 more on two receptions. "I think what really helped our defense is the offense running the football," UH defensive coordinator Jerry Glanville said. "That quarterback can play. That's a good football player. Everything that we did to him, for him to keep playing. I'm glad to get out of here." The Warriors led 28-17 after a first half in which Brennan completed his first nine passes and threw for touchdowns to Dickerson, Davone Bess and Ian Sample. UH also got a huge break when an apparent fumble by Bess was called back and Hawaii -- trying to build on a 21-17 lead -- retained the ball because of an inadvertent whistle before the end of the play. "The umpire (Mike Rhoades) came over and apologized after the play was over and said it has never happened in all the years that he had been officiating," Mumme said. "It's unfortunate, but that's not what cost us the game. We got beat by a better team." Brennan completed his first nine passes before an incompletion at 14:27 of the second quarter, including a 34-yard TD to Dickerson to give UH a 14-0 lead. But the Aggies tied it up with two scores in the space of 34 seconds. Chris Nwoko scored on a 3-yard run, capping a 12-play, 68-yard drive. NMSU elected to deceive on the ensuing kickoff, with Matt Pratt recovering his own onside kick at the Hawaii 46. A face-mask penalty on UH moved the ball to the 31, and Holbrook hit Chris Williams for a 27-yard TD. Williams, who entered the game as the nation's second-leading receiver by yardage per game, caught seven passes for 160 yards and two scores. Brennan hit Bess for a 16-yard score and a 21-14 lead as Bess split the safeties and Brennan found his third option. The Aggies settled for a 25-yard field goal by Ryan Bowling on the next drive. Holbrook appeared to connect with Nick Cleaver for a touchdown, but safety Jake Patek caught up to the play and knocked the ball out of Cleaver's hands. Later, Holbrook eluded Hawaii's pressure long enough on second and 11 to find Williams wide open 40 yards downfield. The 61-yard touchdown clipped UH's lead to 28-24 at 12:39 of the third quarter. Dickerson returned the next kickoff from a yard deep in his own end zone to the NMSU 36. The Warriors drove to the 1, but were stonewalled by the Aggies. UH committed its first and only turnover in three games as Brennan tossed a bad pitch toward Ilaoa on fourth and goal at the 2 and NMSU's Brandon McKinney recovered. The Aggies then drove to the Hawaii 21. NMSU survived Myron Newberry's interception when it was called back because of a roughing call against Lawrence Wilson, but not a fourth-down stand when Holbrook scrambled 11 yards but was stopped short of a first down by Solomon Elimimian (who had a game-high 14 tackles) and C.J.Allen-Jones. Officials -- Referee: Bill Athan; Umpire: Mike Rhoades; Linesman: George Gusman; Line judge: Lance Thomas; Back judge: Jim Cettle; Field judge: Jay Taylor; Side judge: Vern Sparling; Scorer: Garret Ward. RUSHING--Hawaii: Ilaoa 18-94, Brennan 6-28, Mauia 7-26, Graunke 2-7. New Mexico St.: Nwoko 12-59, Holbrook 10-25, C. Williams 1-19, J. Williams 5-13, Gibson 1-7. PASSING--Hawaii: Brennan 22-31-0-330, Graunke 1-3-0-23. New Mexico St.: Holbrook 31-45-1-323, Gibson 1-1-0-7. RECEIVING--Hawaii: Dickerson 6-125, Rivers 5-49, Bess 4-55, Sample 4-42, Ilaoa 2-41, Washington 1-23, Mock 1-18. New Mexico St.: C. Williams 7-160, J. Williams 6-43, Harris 6-34, Cleaver 5-41, Dubois 2-18, Nwoko 2-15, Romaka 1-15, Jolla 1-4, Allen 1-3, Buckner 1-(-3). Tackles for loss-yards -- Hawaii: M. Purcell 4-4, Elimimian 1.5-4, Fruean 1-3, Lafaele 0.5-1, Leonard 0.5-0. NMSU: Nuttal 1.5-1, Brewer 0.5-1. Sacks-Yards -- Hawaii: M. Purcell 3-3, Fruean 1-3. NMSU: Nuttal 1-1. Fumbles forced -- Hawaii: M. Purcell 2. NMSU: None. Fumbles recovered -- Hawaii: Leonard 1-20, LaCount 1-0. NMSU: None. Interceptions -- Hawaii: None. NMSU: None. Passes broken up -- Hawaii: Peters. NMSU: Bryan 2, Carrie, Richardson, Bernard. Kicks blocked -- Hawaii: None. NMSU: Shirley 2. Quarterback hurries -- Hawaii: None. NMSU: None.